I sigh deeply as I see a Flooded Strand enter the battlefield on the opponent’s first turn. It sits there mocking me; an overpriced un-cracked fetchland. The opponent passes with an unmistakable smirk on his face. Suddenly, the hand of Tarmogoyf, Lightning Helix, and Kird Ape seems not powerful enough to get there. What if he plays a Counterbalance on his second turn? Does he have a Force of Will to diminish my pressure? The dreaded Terminus may be looming on the horizon to null my entire deck of creatures and burn spells. My creatures, which were acquired through much saving and trading, now face an uphill battle as pound for pound, their card strengths don’t match those of the controlling opponent. Speed is the name of the game. If I were to rip one creature after another the game may be still mine. But the possibility of drawing lands makes me nervous. I untap, draw for my turn. Taiga smiles back at me, my fourth land. The hill just got steeper. Have you ever faced this? Too many games to count, for me. Here in Japan, blue is the most sought after piece of the pie. Not only do most players appreciate it because of its raw drawing and countering power, but the persona that comes with playing blue matches that of the Japanese. We generally appreciate orderly games in which one can rely on Pondering into the next land drop, Brainstorming for a miracle, or just simply countering a powerful spell with no mana. What we call “small ball” where intricate interactions, predicting the future, manipulating the deck, and playing powerful spells is highly respected. Thus, most major Top 8 decklists here include the color blue. Sound familiar? I have noticed that the American metagame is similar, if not worse. In fact, the most recent major tournament, SCG Dallas, had only one deck in the top sixteen without an Island. StoneBlade, Delver, and other combo decks are rampant. I came to the conclusion, thus, that the affinity towards blue is shared by both of these nations. This contrasts to the metagame I see in Europe, at least as represented by the Bazaar of Moxen. The most recent Bazaar of Moxen 8 in Paris included four non-blue decks out of eight in its top seats. The difference, however, between America and Japan is that there is a sense of loyalty and innovation within non-blue players. They tend to stick to their archetypes and try to master them. For example, my friend is on a quest to becoming the best “Deadguy Ale” player in the area. There is also a a community (perhaps driven together by an inferiority complex) among them as well. Numerous conversations on blogs, in person, and articles mention strategies on how to beat the dominant color. Players who adore playing Death and Taxes, Maverick, MUD, Enchantress, and Elves share ideas of how to get through the war raging on the stack, and pulling it to the battlefield. There is a sense in which we are the tribal rebels struggling against the mighty Death Star. I think that is my contribution I can make to this community. I have been in the tournament scene for over four years, and three of them have been solely focused on Legacy. I attend many of the medium sized events here and read both English and Japanese Legacy articles to broaden my horizons. I thought that it was time for me to contribute back to the society I have been taking so much from. I’m no Caleb Durward, but I do feel I can bring a unique perspective of being half Japanese, half American, who plays a non-blue deck. And I think that it is important for non-blue players like me to unite and exchange ideas, formulating plans to even out the playing field. I think it is time to get over the blues. Now I know what some of you are thinking, “why hate blue so much?” Actually, I don’t. I played blue for a long time, owning my set of Force of Wills and Tundras. For about two years, I tried the original UW Stoneforge, Miracles, and UR Delver, Top 4-ing some local tournaments here. But I wasn’t happy playing those decks. Ultimately, my personality is one that enjoys thinking through the battlefield, not the stack. Piling counterspells and Snapping them back was something that didn’t seem fun to me. So I changed. I became a Maverick player and I have never looked back. I’m a minimalist in terms of the Banned List. I don’t believe that every powerful spell should be banned. I don’t think that blue is broken or that some cards should receive the knock. But I do think that people tend to play what is safest and seemingly most powerful. I don’t think it is right for all of us to play blue. Some of us are actually non-blue players within our spirit and style, but we tend to cave into the desire for winning and play a stock blue list that has performed well. My coming series of articles are geared towards these fighters who want to shed off the blue color and bring balance. We need both the Ying and the Yang to maintain harmony in Legacy. With my experience of playing blue, albeit not as steeped as some Legacy players, I hope I can bring a perspective to non-blue players that is not available in the USA. I hope that I can also bring encouragement from a battlefield where non-blue decks do see success. In return, I am hoping to receive feedback from those who are experiencing the ‘blues.’ Maybe we can come to some solution together. I really am looking forward to learning from you and hopefully you can glean from my perspective as well. I’m sure many of my fellow American friends felt the same upon seeing the card. Protection from players provides not only hexproof, but makes him unblockable. The small text and the obvious picture that screams Merfolk is nothing to sneer at either. My heart sank when I saw the card which made blue dominating even on the battlefield. And it excels at that. But actually, not really. We non-blue players tend to forget that we have many, and I mean many tools to fight anything that is thrown at us. As an example I will share this Death and Taxes list that recently Top 8’d the Paris Bazaar of Moxen, a 695 player tournament. It was piloted by none other than Shahar Shenhar, the 2013 World Champion. Do you notice something? No, I don’t mean the fact that it looks like a stock list, which it sort of is. But there is something that is slightly different than previous Death and Taxes lists. I see a Sword that gets by the little Merfolk, winning the race, generating card advantage. Yes, I see a Sword of Fire and Ice. One sword and my devastation was eased. Some of you may be thinking it is ridiculous I put so much confidence on one easily remove able artifact. Yes you are right, it can’t be. But it is an innovative answer in anticipation to a shifting format. Suddenly, Golgari Charm, Zealous Persecution, and Sword of Fire and Ice become even more valuable as it gives even a small edge against True-Name Nemesis. And they are not valueless in other matchups either. We have the tools to use to beat things. All we have to do is break away from the constant copying of decklists of old tournaments and start shuffling up some innovative solutions in anticipation of what’s coming next. I have had Zealous Persecutions in my sideboard (of Dark Maverick) for a while to fight tribal decks and the mirror, and now and it has suddenly become even more useful that I am thinking about adding a third to the board. With these numerous solutions put together, I think we are able to fight this new Merfolk menace well. Remember also that if the opponent is maindecking Nemesis, it is most likely they are doing it in exchange for Vendilion Clique, which is a natural switch, given the casting cost and other cards in the decks. This should ease our worries (of those who use Stoneforge Mystics like myself), as the opponent is not able to Clique away your equipment, or drop it on the end step, and attack the next turn or drop it for a surprise block. The decks making the switch also lose percentage points against combo matchups as well. Clique simply provides better disruption than Nemesis, and at Instant speed. Remember, we cannot evaluate a card in a vacuum, but in a metagame where decks pressure other decks like janken, or rock, scissors and paper as you like to call it. I think Vendilion Cliques are better in some matchups and worse in others. 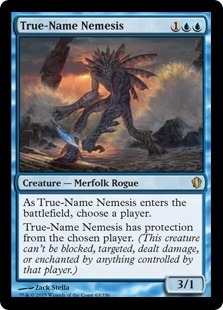 Exchanging it for True-Name Nemesis doesn’t make the deck far superior. The lesson we learn from this card is that we have to take it as a challenge. I believe we have to be willing to cooperate to search out an answer because it exists. I don’t believe Wizards is out to “feed blue” and ignore the other colors. I think all we need is some coming together to come up with some answers. Let me know in the comments section below if you have faced the blue menace and how you have successfully dealt with it. So you may be wondering what my deck is now? Perhaps some of you will simply scroll down to this section to see my list. I don’t blame you. Sometimes you simply need to see an example, a tasty sample so to speak. Well, I will reluctantly unveil my secret tech which I am planning to take to one of the larger events that will be happening here in Osaka. I know what many of you may be thinking. It is an odd list. Why sideboard Thalia, Guardian of Thraben? Isn’t the creature count too low? Liliana of the Veil in the sideboard? Two Gaddock Teegs? All these are valid questions. And I will be more than happy to answer them…in my next article. I want to make sure to leave you with some incentive to read my next piece! However, I will answer how I am planning on beating True-Name Nemesis with this deck. First of all, I have my trusted Sword of Fire and Ice. 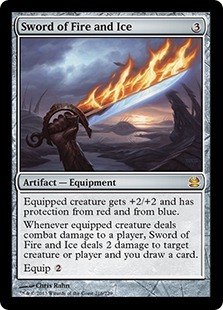 In testing, this Sword has been connecting for some awesome card advantage time and time again. Especially since my list includes many fliers in the form of Lingering Souls, Scryb Ranger, and an Elspeth jump ability, I am able to ignore the fact that protection from blue and red often fails to provide evasion. Against True-Name Nemesis, it certainly matters. Second, my Zealous Persecutions have been a game changer in many matchups. It comes in against Elves, Goblins, Maverick, Death and Taxes, UWx with Lingering Souls,etc. It is a wide catch all and helps race opponents; especially when I have Lingering Souls tokens of my own! Did I mention it gets rid of Nemesis? I hope that my articles will facilitate sharpening of each other. I am hoping to dissect some tournaments I attend and evaluate certain cards as well as decks that are not blue. I also hope to provide some interesting lists that are floating around here in Japan. Let me know if you are interested and we will see where we can go from there. I think it is high time we get over the blues and enter a land where all colors are treated equal. Who’s with me?